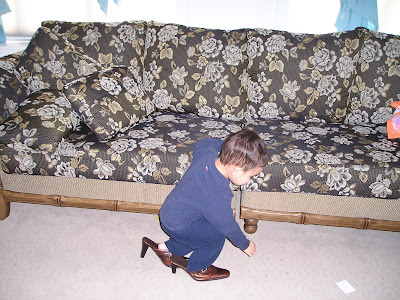 We were all laughing yesterday morning because my son was walking around with my shoes.... with 2 inch heels hehehe.. He was good at it too. 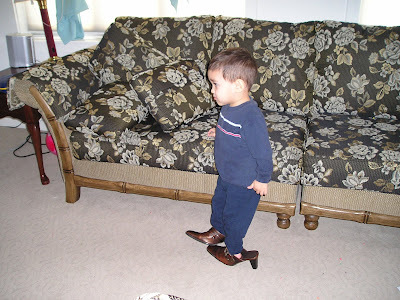 Kids are so funny that they always want to try using our stuff. 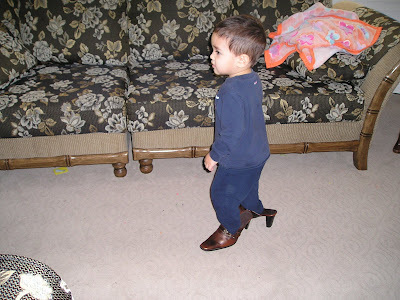 My daughter does that too with my other blouse, if she likes a certain clothes, she would wear it lol.. 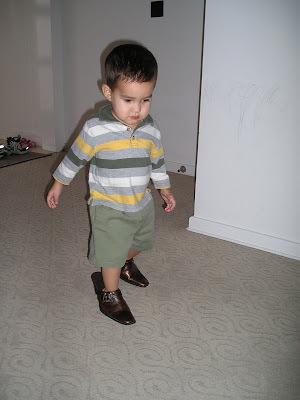 Here are the pictures of our son, walking around the house with my shoes on. 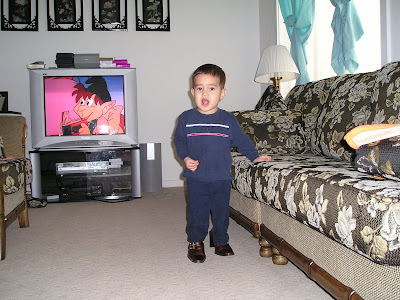 The last picture was taken this morning, he really is fascinated with wearing my shoes lol.. It's the first day of the hearts' month and love is in the air. So I added a little bit of sweetness to our dining table, I stumbled upon a recipe of sweet and sour pork while I was bloghopping yesterday and I prepared it today. Below is the recipe. Sweet and sour pork with pork loin and pineapple, along with seasonings. Cook Time: 1 hour, 20 minutes Ingredients: · 1 1/2 pounds boneless pork loin, sliced 1/2-inch thick · 1 tablespoons vegetable oil · 1 can (20 ounces) pineapple chunks in juice · 3/4 cup water · 1/4 cup vinegar · 1 tablespoon soy sauce · 1/4 cup brown sugar · 1/2 teaspoon salt · 2 tablespoons cornstarch · 2 tablespoons water · 1/2 cup thinly sliced onion · 1 green pepper, cut in thin strips · 2 cups hot cooked rice Preparation: Cut pork slices into strips about 3 inches long and 1/2 to 1 inch wide. Sauté pork strips in hot oil over medium heat until lightly browned; drain. Drain pineapple; reserve juice. Combine pineapple juice, 3/4 cup water, vinegar, soy sauce, brown sugar, and salt; pour over pork in skillet. Cover and simmer 1 hour, or until meat is tender. In a cup, combine cornstarch and 2 tablespoons water; stir until smooth. Add cornstarch mixture to pork mixture. Cook over low heat, stirring constantly, until mixture is thickened and bubbly. Add pineapple chunks, onion and green pepper. 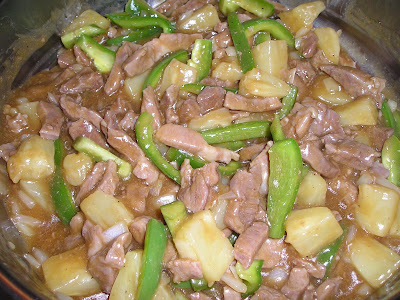 Cover and simmer sweet and sour pork for 10 minutes longer, or until vegetables are tender. Serve sweet and sour pork over rice. Sweet and sour pork recipe serves 4 to 6.